100% synthetic oil "SUPER OIL Premium" with the latest prescription and viscosity selection is newly released from high cost performance HKS engine oil series that is well known to maximize the engine performance. 7.5## newly added to the series maintains oil film at a high level in high temperature range and available for wide applications. 4 different viscosities are applicable to various types of cars such as turbo, NA, eco car, etc. 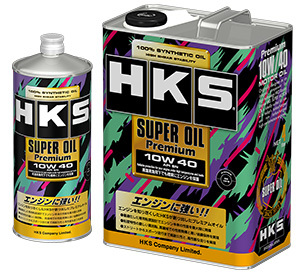 API/SN standard 100% synthetic oil "SUPER OIL Premium" is newly released from HKS engine oil series that is well known to maximize the engine performance. 3 different viscosities are applicable to various types of cars such as turbo, NA, eco car, etc. Engine protection and fuel efficiency performance are balanced at a high level. Superior engine protection and fuel saving performance. The European car's engine performance can be maximized by the optimized velocity exclusively selected for each purpose of use. High performance and oil film maintenance in the range at high speed and temperature require severe viscosity characteristics. High driving performance and durability for street to sports driving. ※　Not available with vehicles equipped with the DPF. European Automobile Manufacturers' Association (ACEA) represents major European car, van, truck and bus manufacturers. They defines specifications for engine oils, and the way of their evaluation is different from API standard and is more strict. 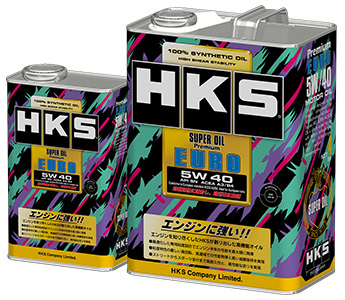 100% synthetic oil "SUPER OIL Premium" with the latest prescription and viscosity selection designed exclusively for a diesel engine is newly released from high cost performance HKS engine oil series that is wellknown to maximize the engine performance. 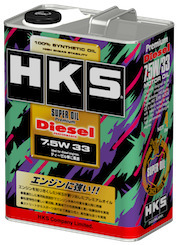 Maintains oil film at a high level in high temperature range and available for wide applications. 100% synthetic base oil is applicable to a diesel car equipped with DPF. It is ideal for clean diesel cars.